With a rugged rain barrel from ABC Seamless of Albuquerque, New Mexico homeowners have found the ability to keep their lawns and ornamental foliage watered and healthy despite drought conditions. Plus, rain barrels help prevent landscape erosion from water runoff, preserving the carefully crafted aesthetic of homeowners’ properties. 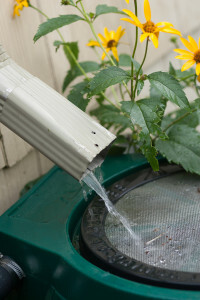 In this way, a rain barrel is a terrific tool for those who are environmentally conscious. Rather than using precious municipal water sources, our rain barrels allow homeowners to capture and repurpose rainfall and snowmelt, saving valuable resources that are notoriously scarce in the American West. But that’s not all. As a premier home renovation company in Albuquerque, ABC Seamless can help you improve the look and energy efficiency of your entire home. Our seamless steel siding is girded with a remarkable blanket of insulation, providing a virtually impenetrable barrier that keeps outside air out, helping your home’s HVAC system more easily maintain a comfortable indoor temperature all year long. As a result, many of our clients see a substantial decrease in their monthly energy bills. Call ABC Seamless of Albuquerque today to learn more about how we can help you help the environment with our rain barrel products and other energy-saving materials. We’re proud to be the home renovation company of choice for residents in Albuquerque, NM, and all surrounding communities.